Ask fellow campers about "Daingerfield State Park" and nearby attractions. Only 10 sites in that area, all pull thru. It's a very quiet park. If you camp in April, the pine trees have yellow pollen that gets everywhere, all over your truck, camper, picnic tables. Bring a blower. The site itself was beautiful and private. The lake is small with a lot of lily pads and moss. If there has been rain, you don't want site 7 due to drainage. Other sites were very nice. We camped at Daingerfield State Park in a Travel Trailer. This was our first time at Daingerfield State Park. The staff that checked us in was very helpful. We had reservations in the Big Pine Premium Site area. We were assigned Site 7 which is probably the choice site. The site was level and easy to get in and out with a nice view of the lake. The shore was covered with Lilly Pads and fishing was not possible but the site was great. The sewer connection was a few inches above the ground level but caused little problem. We will return. We camped at Daingerfield State Park in a Motorhome. We got to the campground around 12:30. Went in and a very nice park employee was working (believe her name was Ms Wolf). in all the years I have never had such a nice helpful and courteous front desk person. Very knowledgeable and was very helpful in getting us the right site. If you are here and she is worki g thank her for her service. Now about the park the pull through site was level but a little tight but what a view of the lake!!! We have decided this is one of our favorite parks. We camped at Daingerfield State Park in a Travel Trailer. With advanced FHU reservations made 90 days prior to arrival for a 2-night stay, we arrived on a week day while rangers were out to lunch, so we proceeded to Big Pine Camping Area, selected site #10 along the lake and close to toilet/shower house. dumpster, and camp hosts. Narrow asphalt pull-thru site slopped towards lake making leveling with drive-on blocks necessary. Huge site under tall pines with pines needles underfoot and one fantastic view of the lake with lots of vegetation between us and the next site. Fairly quiet as mostly older adults and few children filling campsites. Significant drop-off from the asphalt surface down onto the pine needles. Park entrance gate closed at 10pm requiring access code to enter throughout night. Firewood for a donation available at park entrance office. Big negative on site #10 was that the camp host directly across the road had a spot flood light illuminating their CAMP HOST sign which burned all night long! We camped at Daingerfield State Park in a Travel Trailer. The town of Daingerfield is very close by this State Park. Camped in February of 2018. Had the park to ourselves the first night. Staff was helpful and park was very clean. All sites were full hook up. This park quickly become one of your favorites. We camped at Daingerfield State Park in a Travel Trailer. Price is for full hook-up (all RV sites are FHU) at $20 plus $4 daily visit fee. Camped up hill from lake (very pretty spring-fed lake) in Mountain View area. Sites there are best suited for smaller rigs since many are quite short and not real level. The road is also quite narrow. It's the best loop for OTA TV signals, though, because of elevation. Verizon signal was also decent. Might pay off to scope out which site you want before picking, especially if you will be there for more than a night or two. Quite a few had the picnic tables/fire-rings on the same side as the utilities rather than on the RV house-door side. Restrooms in this loop were modern and very clean. There are more full hookup sites in the Dogwood loop which is on the lake, and about ten pull-through sites in the Big Pine area (those are premium sites and cost $5.00 more). We camped at Daingerfield State Park in a Motorhome. Standard state park amenities, nice little lake with paddle oats/canoes/kayaks to rent. Some sites not suitable for rv's due to slope. Recommend sites 6-10 in Big Pine loop. FHU, nicely spaced, fairly level asphalt pads. We camped at Daingerfield State Park in a Motorhome. Daingerfield State Park Texas is one of our favorite Texas State Parks. 140 miles northeast of Dallas. Beautiful clear, spring fed lake with no motorized boats allowed. Great swimming area. Canoes, kayaks and paddle boats for rent. The park was built by the CCC in the 1930's. Many original structures and buildings remain. Nice hiking trails, a couple are strenuous. All RV sites have full hookups (W/E/S). Three RV camping loops, Big Pine, Dogwood, and Mountain View. Only Big Pine is suitable for 30+' RV's. Mountain View and Dogwood best for less than 30' RV's. We were in site 10 in Big Pine, our favorite lakefront site. We've been here many times and will return. We camped at Daingerfield State Park in a Fifth Wheel. What a beautiful park... Lake, shaded area, easy pull thrus , fire ring, nice trails beautiful scenery. We camped at Daingerfield State Park in a Travel Trailer. Rate reflects no access fees due to Tx State Park Pass. Beautiful park, well kept and very clean. Some sites are FHU, pull thru curves. Power was steady at 123v, water pressure was 65PSI. We had a FHU site, sewer was convenient and well placed. Quiet park with nice 2.5 mile trail around the lake. They have a store which sells ice cream, souvenirs and rents canoe's, paddleboats and kayaks. Very friendly staff and good presence. They do have a swim beach, but day use is away from camping areas which keeps traffic down. We would stay here again. We camped at Daingerfield State Park in a Motorhome. Walk the 2.5 mile trail around the lake. Beautiful views and lots of birds. A beautiful peaceful setting. I don't think we would pay for the "lake" view again since only those campers directly next to it can really see it. We were across the street and the campers blocked our view. We would stay anywhere else in the park though as the sites were level, had full hookups and were so quiet and peaceful. The showers were large but no air conditioning to speak of. A bit warm in the summer. Just a lovely place though and we will definitely come back. We camped at Daingerfield State Park in a Motorhome. Another beautiful CCC park built in the 30's. Campsites had a mix of paved and unpaved drives. Medium size rigs might have issues with some of the sites in the Mountain View and Dogwood Campgrounds and large rigs should stick to the Big Pine Campground. Bathrooms must have recently been rebuilt as they look brand new and were immaculate. Nice swim area that we took advantage of. One complaint, the 30 amp socket was installed upside down in our campsite. 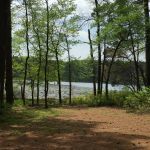 We camped at Daingerfield State Park in a Travel Trailer. We were in Big Pine loop full hookup site #10. Great site. Need a step because of pad drop off. Big Pine is great for large RV's the other loops are too small for 35'+ RV's. Great hiking and swimming. Spring fed lake with no powered boats. One of our favorite parks in Texas. We camped at Daingerfield State Park in a Fifth Wheel. We stayed here for one night while heading west. Once we arrived It was so nice we would have stayed another night if there were space available. The Big Pine camping area really is big rig friendly. We were in a spot near the lake with a great view. The spot was nearly level on asphalt. The sites have a fire ring and aluminum picnic table. There are walking trails around the lake and from the camp sites to the swimming area. Due to the recent rain a couple of the sites were a bit muddy in places. We chose a site that was drier since we arrived early and most sites were still vacant. They assigned us a spot on check in and told us to call and let them know if we were in a different spot. We will definitely stay here again if in the area and will try to make it for more than one night. We camped at Daingerfield State Park in a Motorhome. Beautiful setting, gorgeous lake and trees, nice trails. Big Pine loop is big rig friendly with large, mostly level pull through sites. The other camping areas have a few large campsites, but most are about 25 feet by 25 feet or smaller, and are not very level. All sites have asphalt pads. Very few people were there will we were there, so it was pretty quiet except for some traffic noise from the nearby highway. The restrooms are in great shape and very clean. WIFI is available at headquarters and the park store, but the signal is weak. Verizon service was strong 4G however. As far a television, we could only pick up two stations, ABC and Fox out of Shreveport. There is a fishing pier, cleaning station, and there are canoes, kayaks, and peddle boats for rent. We camped at Daingerfield State Park in a Travel Trailer. Are you affiliated with Daingerfield State Park ?